The Viscount De L’Isle MBE, of Penshurst Place, near Tonbridge, was born Philip Sidney in 1945, a descendant of the great 16th Century soldier poet. Commissioned in the Grenadier Guards in 1966, he served on Regimental duty in the British Army of the Rhine, Northern Ireland, Belize and Berlin. From 1974-76 he held an operational Staff appointment at Headquarters, 3 Infantry Brigade and was awarded an MBE in 1977. He retired from the Army as a Major in 1979 to manage the Penshurst Place Estate and chaired Kent Country Landowners Committee from 1983-85. Succeeding his father, the 1st Viscount De L’Isle VC KG, in 1991, he sat in the House of Lords from 1991-1999. Viscount De L’Isle was Honorary Colonel of the 5th Battalion, The Princess of Wales’s Royal Regiment from 1992-99. Since 1992 he has been a Trustee of Canterbury Cathedral Trust, becoming Chairman in 2007 and President in 2014. In 2004-09 he was a Member of the Lord Chancellor’s Advisory Panel on National Records and Archives, and is a Kent Ambassador. From 2006-2012 he was additionally appointed Honorary Colonel of the Kent Army Cadet Force and received from Hampden Sydney College, Virginia, a Doctorate of Humanities, honoris causa in 2012. 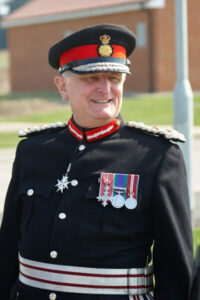 He was appointed a Deputy Lieutenant of Kent in 1996 and Vice Lord-Lieutenant in 2002, taking up his appointment as Lord-Lieutenant of Kent on 1 September 2011. Viscount De L’Isle married Isobel, née Compton, in 1980, and they have two children: Sophia (The Hon. Mrs Maybanks, born 1983) and Dr The Hon.Philip Sidney PhD (born 1985). Viscountess De L’Isle (Isobel), née Compton, daughter of Sir Edmund Compton GCB KBE (d 1994) and Betty Williams (d1987). Sir Edmund was a senior Civil Servant, Comptroller and Auditor General and appointed first Parliamentary Commissioner (Ombudsman) by the then Prime Minister Harold Wilson. Lady De L’Isle was educated at St Mary’s Calne, Wiltshire, and taught cookery at the Cordon Bleu, before starting her own cookery school. Subsequently she was Secretary to two Charitable Trusts before marriage in 1980. Appointments she has held include Regional Committee Member of the National Trust 1982-1997, Chairman of Rural Development Commission Committee for Kent, Sussex and Surrey 1991-1997, President of the League of Friends at Pembury Hospital 1992-2016 and she received from Hampden-Sydney College, Virginia, a Doctorate of Humanities, honoris causa in 2012. The Lord-Lieutenant and his Deputies have a great range of experience and expertise in very many fields. Between them they are president, patron or members of very many County organisations – from the Royal British Legion to St John Priory Group, Kent, and from the Friends of Kent Churches to Kent Farm Line.